It is the job of managers to make sure that everything within the company stays organized and everyone is as productive as possible. But there will come a time when certain changes need to be made and it is then up to management to figure out just what needs to be improved to ensure the business’ success. 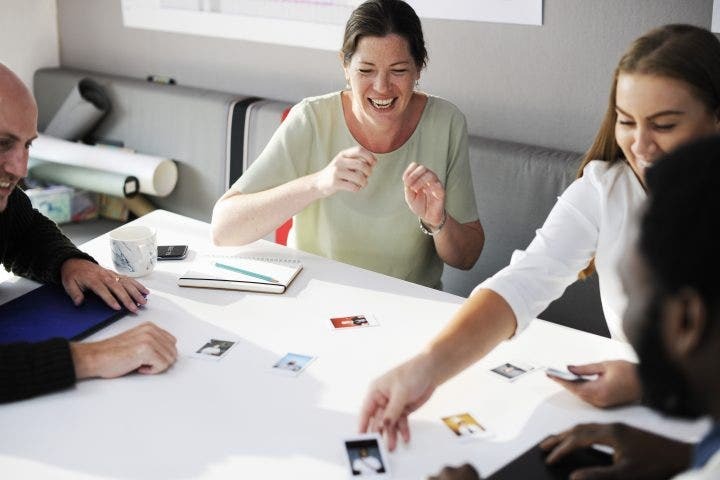 Although managers can come up with ideas to improve the office, another effective way to figure out how to make performance and productivity improve is by asking the employees. Considering that these people are directly involved in business operations, it is best to ask them what can be done to make things better in the workplace. And this is where employee suggestion forms come in as tools for helping a business achieve its goals. 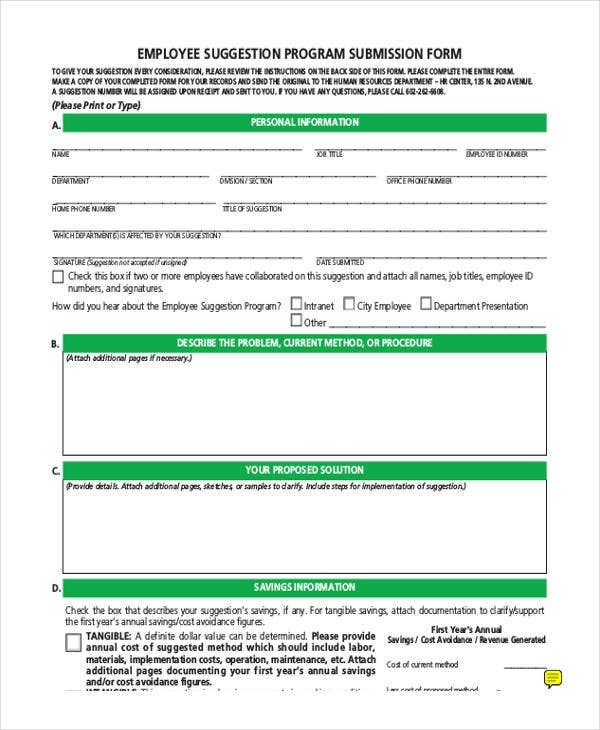 Creating an employee suggestion form is definitely something that you want to do when you wish to continuously improve business processes. While some managers prefer to keep the form as simple as possible to encourage more ideas, others prefer an extensive form to encourage employees to think carefully about their suggestions. Should the form be anonymous? Think about this; are employees willing to offer suggestions if they can do so anonymously? Most likely the answer would be yes. The option of remaining anonymous can make employees feel less nervous about sharing their ideas on how they can improve the office. They may even come up with more creative ideas as they do not have to fear being ridiculed by their peers or being reprimanded by their superiors. However, you have to know that soliciting anonymous ideas also has its drawbacks. For example, what if one idea from an anonymous employee ends up becoming the one thing that dramatically increased the production of the company? How will the professional managers then thank the employee came up with the idea if they do not even know who did it? You will not be able to reward those employees who have given the company the advantage it needed over its competitors. This is why it is best to know the name of the employee who suggested the idea, but give that same employee the option to either remain anonymous or publicly announce that he or she was the person behind the idea. Make sure that you give them this option as some of them may just want to take full credit should the company actually benefit a lot from the idea. A detailed description of the idea, preferably at least four to five sentences. The reason why the suggestions above are not exactly recommended is because you want to make sure that the form remains as simple as possible so that you can gain a lot of ideas from it. You can always get further information at a later date. Asking for complex information will just end up reducing the number of ideas that the employee could have submitted. 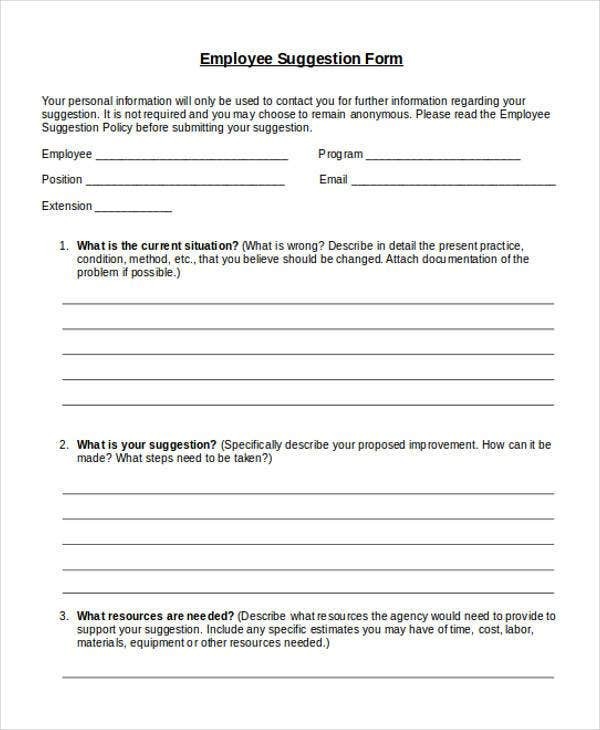 So when the time comes for your company to conduct employee training, be sure to include how these employees can fill up the suggestion form so that things will be much easier for both them and you. If you just allow employees to suggest ideas about anything, then most likely they will end up getting confused and unsure about which ideas are welcome. You may just prevent them from submitting anything if you leave the submission ideas wide open. Instead, you should consider limiting the suggestion program. Focus on idea generation for one specific topic. Think of something that will tell the employees that they need to suggest something that can help with a specific operation within the business. If there is a particular problem in your company, then seeking solutions for that specific problem may be your best option. Depending on the topic that you picked, you can come up with the right questions you should place in your suggestion form. 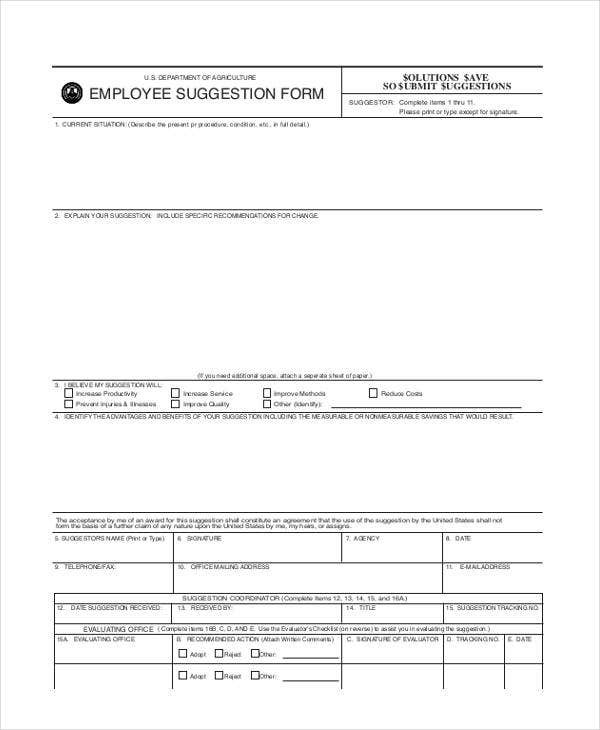 Should the employee suggestion form be answered online? Old-fashioned suggestion boxes can still work today. 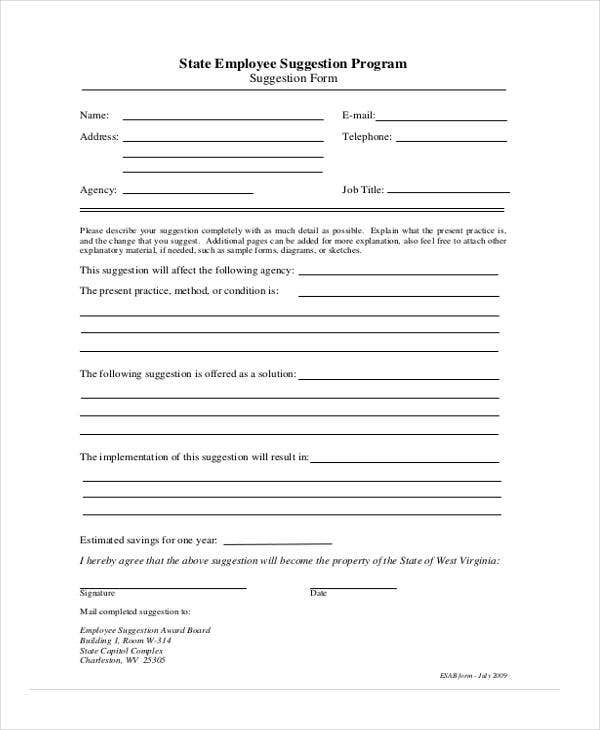 You can get these employees to fill up physical copies for suggestion forms and then direct them to submit these forms into wooden boxes where they can all be compiled. 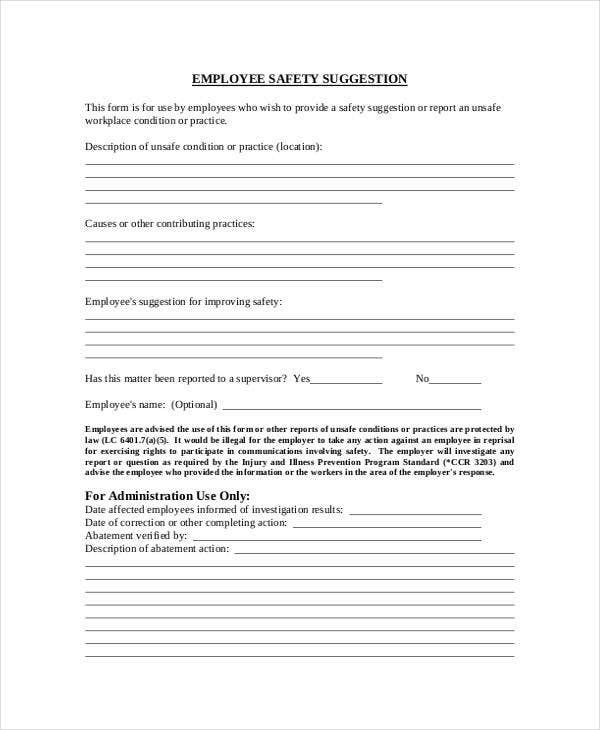 Your suggestion form should have the perfect balance of requesting more information from the employee and keeping the form as simple as possible. 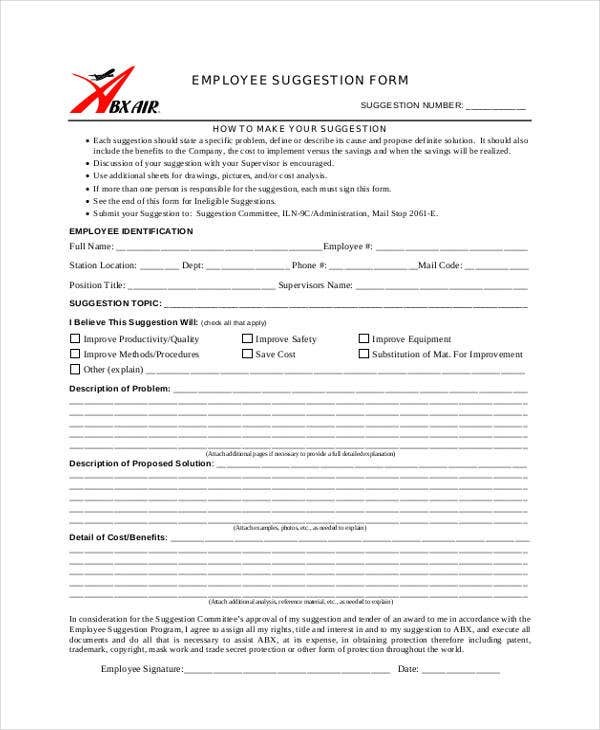 There is no such thing as the perfect employee suggestion form, so just try to follow all of the suggestions above to help you make one that is as effective as possible. If possible, create a committee or a task force that will review every single suggestion that the employees make. Instruct them to make sure that they include all employees from the multiple levels within your organization. This is so that all of the suggestions will have a chance to be considered from more than one point of view. Doing this will also encourage your employees to make submissions as they know that their ideas are going to be thoroughly reviewed. Right from the very beginning, you have to stress that you want these employees to provide constructive and results-oriented suggestions. You have to make it clear that every submission should contain as much detail as possible and that they should go beyond simply stating a problem within the business. Encourage your employees to carefully think about their submissions by providing them with a guideline. 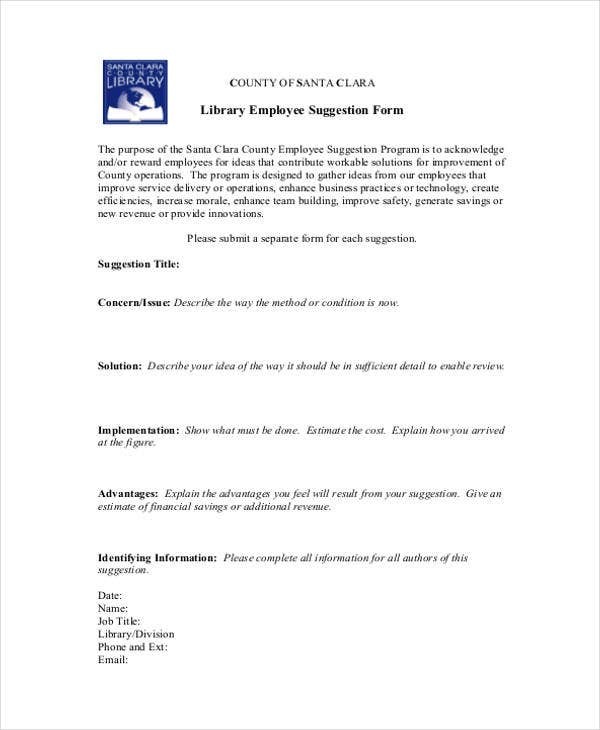 List out the type of ideas that you would like the employees to submit, with a couple of examples that can serve as a reference for each idea. Be sure that you include the key areas that you want the employee to focus on when they start submitting their ideas. 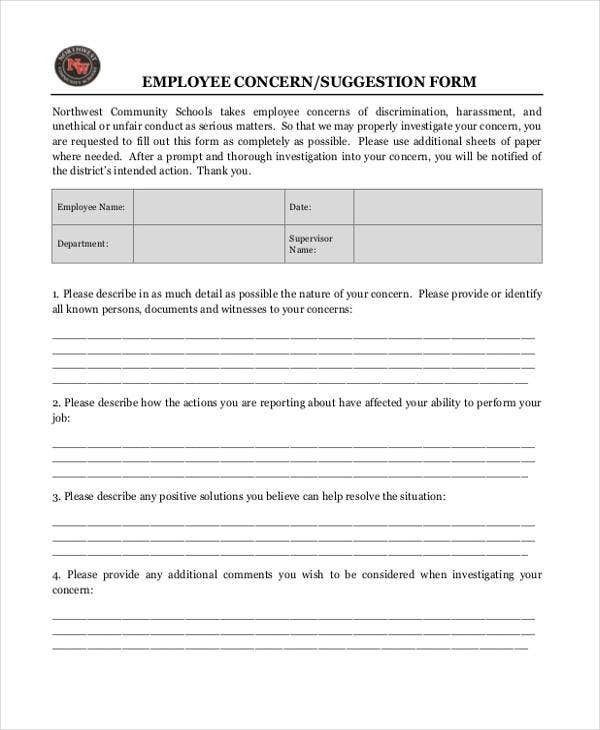 In addition to asking employees for ideas, request that all of these submissions provide a solution or a tentative action plan. This can help ensure that the employees take their time and think carefully about every submission that they make. It will also spare you and your team from spending excessive time reading through all of the submissions that may have pointless or unrealistic suggestions. Suggestions should also include recommendations of individuals who the employee thinks would be the best person to head the implementation of whatever idea they submit. This is similar to requesting the solution for particular ideas as it can help employees think thoroughly about their suggestions before they submit it to you and your team. Sometimes employees are afraid to submit their ideas because they think their employers might think differently about them once they share their suggestions. By giving these employees the choice of remaining anonymous, you are also giving them a lot of room for freedom as they do not have to feel the tension of knowing that people will be aware that they submitted a potentially controversial idea. They will come up with more creative ideas that may just help you and your business out. Also, you should consider putting in a checkbox where the employee can decide whether he or she wants to remain anonymous for any idea that is submitted. This is because some of these employees still want to be credited for an idea that may just help the company head toward success. 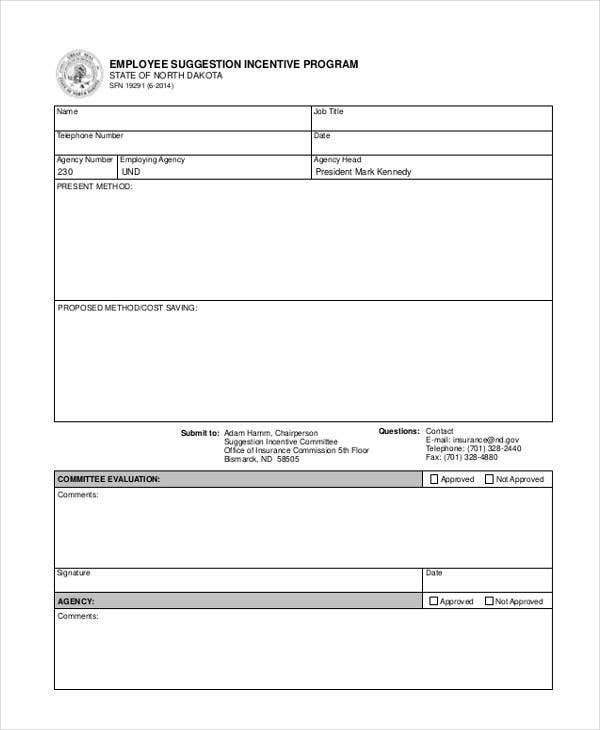 For every submission that you receive, make it a point to review these forms within a specific timeline. So be sure to provide feedback for all the submissions that you receive so that employees will be able to understand why their ideas have either been approved or denied. Any rejected idea could discourage the employee from submitting more ideas, so you have to make sure that you thank them for making the suggestions and state that you would like them to keep submitting ideas to help improve the business. In what time frame are suggestions going to be reviewed? How are you going to go about the review process? How are all of the suggestions going to be evaluated and who is going to review them? If a suggestion is determined to be viable, then who is going to be responsible for implementing it? How is the implementation going to be determined? When should employees expect to receive the feedback on the suggestions that they have made? Is there any kind of reward for any suggestions that are going to be implemented? Share the details of whatever changes or improvements are going to be implemented within the company. You can do this by sending an email to all of the employees or by putting in a story about it in the company newsletter. If the employee wishes to take credit for the idea, then you can give that person some well-deserved recognition and you can show the rest of your employees proof that their suggestions are actually being considered. 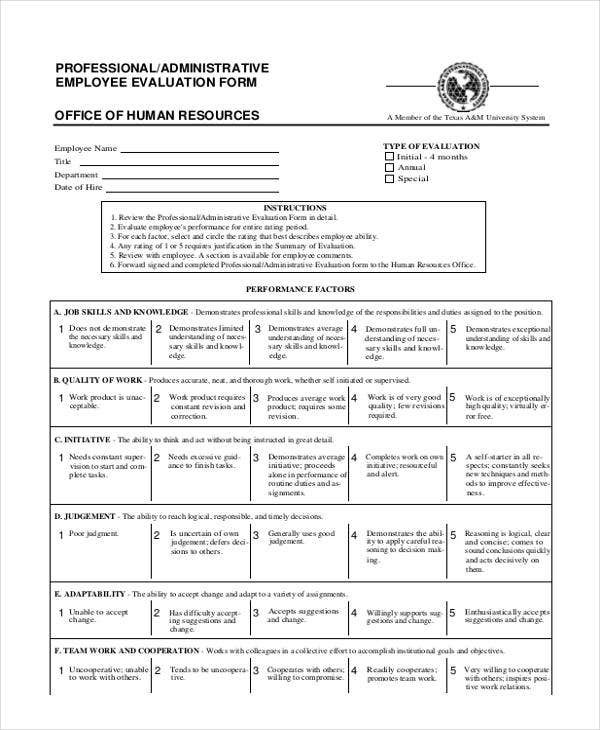 If you would like to learn more about employee suggestions or anything employee-related such as how to make use of a job application form, then click on any of the related posts.